Well, gone are the days of families worrying! For the first time ever, we have come across the mifold grab and go booster seat (www.mifold.com) that can literally fit into a child’s backpack or mom’s purse, and can easily be placed in any taxicab or ride sharing service vehicle within seconds. We are edging ever closer to Back To School and we were asked our thoughts on the mifold Grab-and-Go Child Restraint. mifold is the most advanced and compact, portable car seat ever invented. If you ever help out friends or family with the school run regularly or occasionally but don’t have enough car seats or don’t want to shell out a fortune on a big one only to use it now and again then this is the product for you! Moms or grandmas of 4 to 8 year olds – I have a fun giveaway for you today!!!!! It’s called mifold – the world’s smallest booster seat!! mifold® Grab-and-Go booster seat® is the most advanced, compact and portable child car safety seat in the world. It’s more than 10x smaller than a regular booster and it’s just as safe. mifold works in the exact opposite way to a traditional booster seat. Instead of lifting the child up, mifold brings the seatbelt down. After decades of improvements in the rate of adoption of child restraints, there are still many journeys where children do not have an appropriate restraint (estimated at 20% of all journeys). There are times when a booster seat is simply not available. With mifold, we eliminate these real-life limitations. For the first time ever, mifold is solving the problem when a bulky restraint is not available. We’ve all done it, although some of us more than others. Whether it’s a trip to and from the airport, in a taxi or vacation rental car, a rideshare like Uber or Lyft, carpooling, or riding with Grandma…we’ve all cut corners with our booster seats. I thought that my wife and I have been pretty diligent. That we always made an effort to ensure sure our boys safety. Then she reminded me our last vacation. The shuttle rides between the San Diego Airport and the rental car center. Such a short little ride, but unprotected. mifold car booster seat giveaway + hifold announcement! It’s a struggle. While we have full size boosters in our cars for everyday use, it’s not practical to uninstall them every time for a field trip or visit to grandmas. And even then I have to worry about the seat being installed correct. Luckily, the mifold is a solution! Have you ever been on vacation and found yourself in a position where you needed to transport your child in a taxi, but you didn’t have a booster seat? Although these situations in the United States are often legally exempt I always worried about my daughter’s safety. Lugging a booster seat around town wasn’t a realistic option, but I kept having taxi rides that made me sick with worry. I also dreamed of a less cumbersome booster seat to pack when I knew we were renting a car. Imagine my excitement when I first heard about the MiFold Booster seat! This seat promises a safe booster option that folds up and can be easily brought along when traveling with your child age 4 years and older weighing 40 pounds or more. A regular booster seat raises a child up so that the seat belt is positioned safely across the hips and clavicle. The MiFold instead sits flat against the seat of the car and uses 3 belt holders to make sure the seat belt is properly aligned to the child. Always make sure to read the instructions fully before using to ensure the seat is set up properly for your child. The first belt guide is an adjustable strap that goes behind the child (much like a backless booster shoulder strap adjuster). The shoulder harness of the seat belt is inserted into a clip at the end of the MiFold strap to ensure it goes across the clavicle properly. The other two belt guides are on either side of the unfolded seat. These hip belt guides are adjustable to the size of the child and help position the lap portion of the belt across the hip bones. We took our MiFold on a driving trip around Southern California for several days. This is what we learned from our experience. It is easy to pack in your carry on, backpack or even a large purse. miFold is much smaller than a traditional booster seat. You have a safer (portable) option for taxis and car services instead of going without a booster seat. MiFold is an inexpensive booster seat option (affiliate link: buy on Amazon). Elizabeth complained it was uncomfortable every time we drove more than a few minutes. It did not fold as compactly as the pictures indicated. The shoulder strap holder did not have a way to be secured in between use. Unlike a regular booster where a child can buckle themselves in, this seat design requires a parent to assist getting a younger child safely into the seat each time. Although it wasn’t exactly what I had hoped for I am still very glad that we purchased the MiFold. The MiFold has been my go-to booster seat for when we take a cab or car service to and from airports over the last few months. It is also useful if you will be taking longer cab rides around a metropolitan area. Our recent family vacation included an airplane ride, car rental with interstate road trip and some vehicle changes. We have three children and traveling is getting a lot easier as they get older. Our youngest still uses a booster seat which is the only additional item left for us on our travels — no convertible car seats, pack n’ plays etc.! 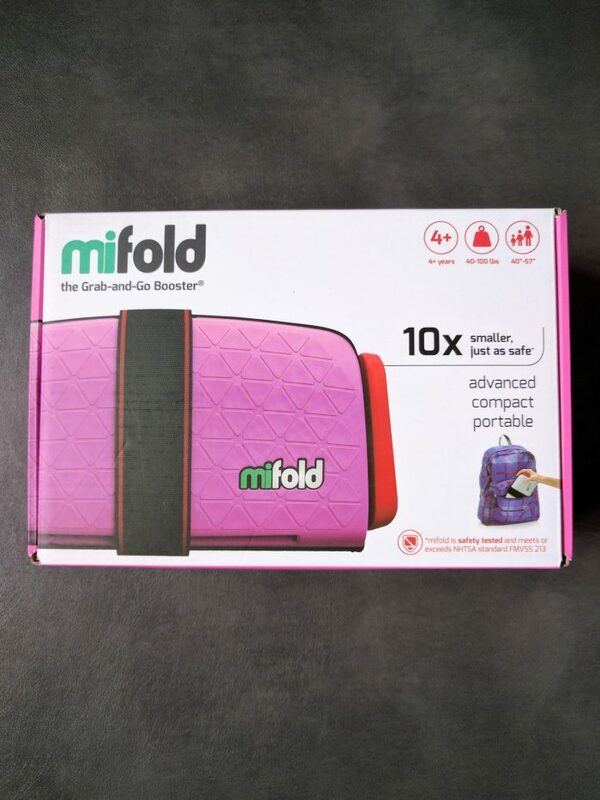 mifold makes this one extra item even less of a burden and it’s now sold at Target stores nationwide! Having young children, means equipment, and lots of it! Some of the things, like a car seat or a booster, is a must have. With my van being the primary car to drive around the kiddos in, I have the bulkier, more installation intense, high back, 5 point harness booster for my 4 year old. While I love the booster seat that I have for my Nolie Bear, its a pain to move (especially since he insist on sitting in the 3rd row). Because of this, there is no way that I am going to move it for every whim that he has, like wanting to ride in daddy’s or his grandparents car for a 5 minute drive. So, for the times that he wants to go on an adventure with someone else, there is the mifold Grab-n-Go Booster! This compact booster is perfect for kids ages 4-12 and makes traveling with car seats so much easier. I love that this safe booster fits in my carry-on luggage and I don't have to check a bulky car seat at the airport. This car seat is ready to use and is great to use when renting a car or traveling by taxi. The 10X smaller booster seat protects the child by positioning the seatbelt instead of just lifting the childlike regular booster seats. My big boys love sitting in this booster. This booster comes in many colors also. The BackerKit crew has been at CES 2018 for a few days now meeting dozens of crowdfunding creators. We’ve been getting priceless hands-on time with projects and impressed with the overall crowdfunding presence here. We’ve spent most of our time in the Eureka Park Marketplace located on the lower level of the Sands where the most promising tech pioneers are showcasing and demoing their tech. There’s an overwhelming amount of things to see, and we wanted to share a handful of cool projects that were brought to life through the power of crowdfunding! The statistics are downright scary. Road traffic crashes are the second leading cause of injury death among Filipinos, including children. These incidents are so common that about 100 children, ages five to 12, become victims of road traffic injuries every single day. Unfortunately, these numbers are only bound to rise in the years to come. As more vehicles hit the road, more car crashes are likely to occur. In 2010, there were 6,634,800 vehicles registered with the Land Transportation Office. In 2015, the number climbed up to 8,703,236. Consequently, the Metro Manila Traffic Accident Recording and Analysis System (MMARAS) reported that there were 90,258 road crashes in Metro Manila in 2014. Only two years later, in 2016, the number had risen up to 109,322. 3 in a row? A booster seat that puts the others to shame. Car seats. Booster seats. Car manufacture rules, state and federal laws. Laws for Taxi's, school buses, airplanes. It's exhausting as a parent to keep up. They say that 95 percent of new parents install car seats incorrectly. 95%! I mean, these are new parents people! The most diligent, careful, paranoid people out there, and even THEY can't get it right? Well, as a parent, let me tell you why. Because each car has different guidelines, each car seat has different guidelines based on your car, the age, height, weight of your child at each and every stage of their life. It's impossible to keep up. 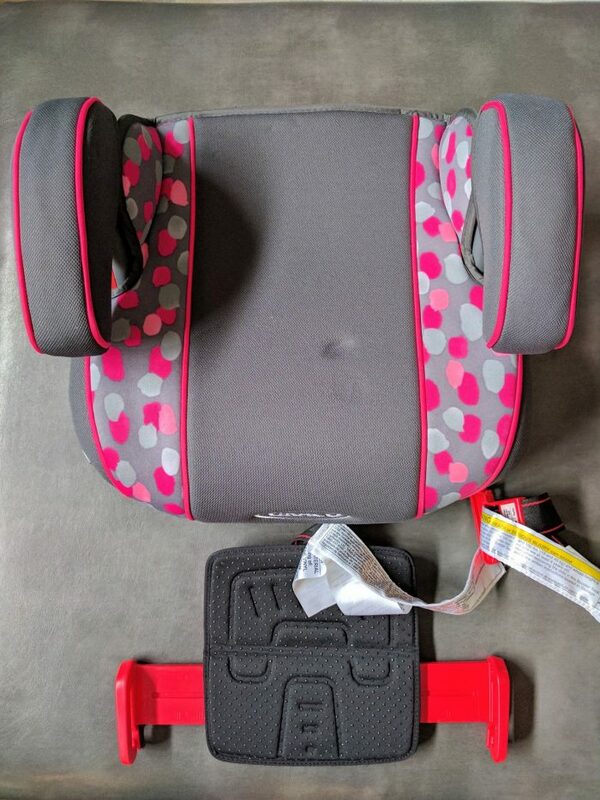 The shoulder straps, the latch system, using the seatbelt when they get to heavy for Latch, rear facing, forward facing, infant car seats, convertible car seats, booster seats. It's INSANE. Now wonder we as parents can't get it right, not to mention that they expire. So then every 5-7 years you have to learn a whole entirely new system. this is what I call CRAZY. 9 Products to Keep You and Your Little Winter Athletes Going Strong! Winter sports means carpools and extra kids to tow. Smart, compact, clean and safe, the mifold® the Grab-and-Go Booster is a super-compact car booster seat perfect for traveling because it folds up and fits into a purse, glove box or luggage which is why its safety and effectiveness is so amazing. What is a Mifold Booster Seat? Mifold is a booster seat that adjusts the adult-sized seatbelt to securely fit a child. Two red lap belt guides hold the lap belt accurately on the hip bones. The shoulder strap and red clip aligns the chest strap with the child's shoulder. Designed to conform to EU regulations R44.4 and to exceed US regulations FMVSS 213 in line with IIHS Booster Belt Fit Rating and the Safety Belt Safe booster use guidelines. At 1.6lb (750g) mifold weighs the same as a small bottle of water. The mifold sets up in less than 30 seconds and it adjusts to 3 shoulder widths: small, medium and large. Designed for ages 4+. USA: children from 40 Ibs to 100lbs. EU: children from 15kg and up to the height of 150cm. Specific regulations differ by country and could be based on age, weight, height or a combination of these. The Ultimate Last Minute Stocking Stuffer ~ mifold Grab-and-Go Car Booster Seat! The countdown has begun with Christmas only five days away! Fear not, Santa has something up his sleeve. mifold the Grab-and-Go booster seat is the ultimate last minute stocking stuffer that will delight kids and parents alike. Available on Amazon.com for easy ordering to arrive before the reindeers land! Smart, compact, clean and safe, mifold is a super-compact car booster seat that folds up and fits into a purse or backpack which is why its safety and effectiveness is so amazing, especially for travel during this holiday season. The Grab and Go Booster works differently than regular booster seats—instead of boosting the child up to meet the belt, it pulls the belt down into perfect position for your child which makes it safer than traditional boosters. Invented by dad-preneur Jon Sumroy, it's a must-have in all cars at all times to ensure no child goes without a booster seat.